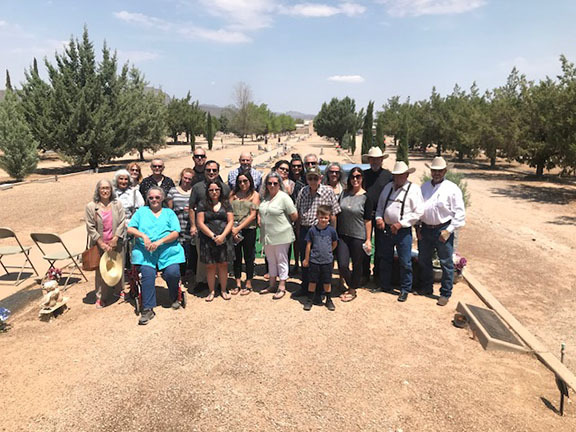 Drove to Kingman yesterday for the funeral of my cousin Taplou Duncan Weir. She was the historian in our family, not me. I always deferred to her on our family history. The funeral took place at Mountain View Cemetery where my mother and father are also buried, as well as too many of my classmates. 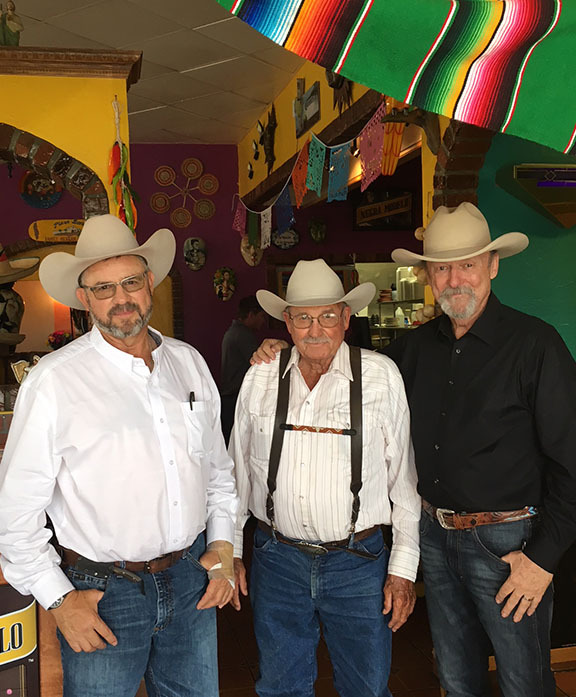 That's me, third from right standing with my Kingman cowboy cousins. Afterwards, one of them, Billy Hamilton, bought lunch for me and his son, Craig Hamilton. Grandfather Bob Guess holding a young Billy Hamilton. Who's on the other horse? When I showed the above photo to Billy, he said, "Well, that's Shamrock on the right and I believe that's Old Tom on the left." This is hilarious and so dang cowboy. My cousin Billy doesn't care a whit about the people, he went straight for the horse's names! 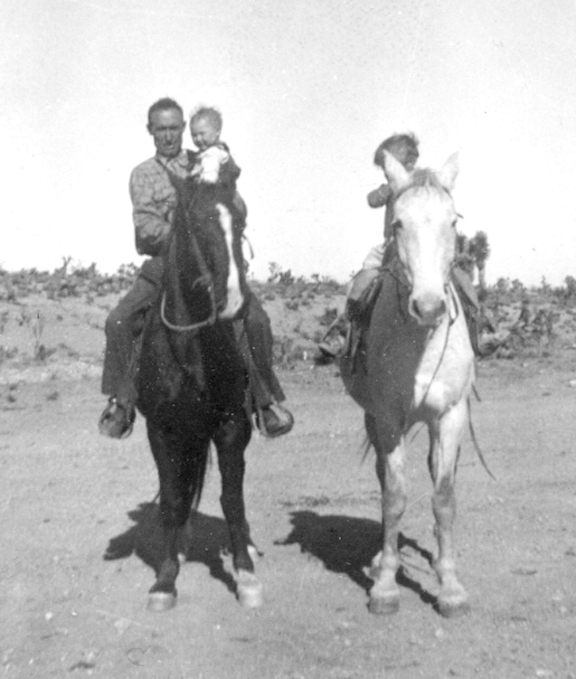 He and his son Craig must have spent five minutes discussing each horse's lineage. After much coaxing by me, Billy speculated that it might be Jean Linn on Shamrock. From the left, that's Mary Guess Hamilton, Billy's mother, holding him. Next to Mary is Sadie Pearl Duncan (Taplou's mother) and her husband—Tap Duncan's grandson—oh, what the hell is his name? I'd normally call Taplou and she'd tell me (sigh). The two little girls are Patsy and Jean, and that's my grandmother Louise next to her husband, and my grandfather, Bob Guess, and that's my mother on the right. Taplou, no doubt, would have also told me many other things about those two photographs and now that resource is gone, forever. I can only remember and appreciate how diligent she was about our family's history and count it as a blessing. 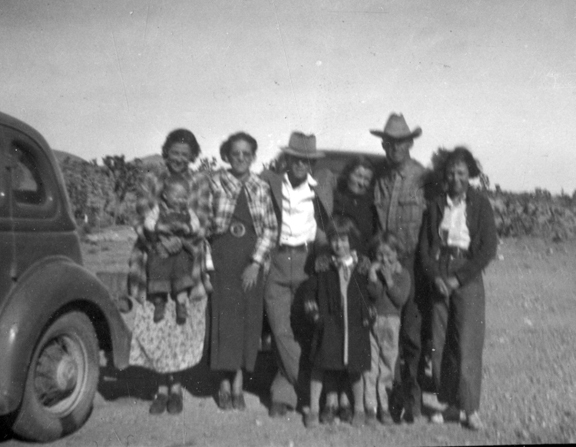 So if you're like me you want to know what was going on in the world while my mother and her family were posing for pictures at the King Tut Mine in northern Mohave County, Arizona? "With Nazi propaganda on full display during the 1936 Olympics in Berlin, The Times detailed how athletes acknowledged the country's new ruler, Adolf Hitler, during the opening ceremony. 'In general the salutes stoody about equally divided between the Olympic and Nazi,' The Times reported. 'The Americans provided their own speical salute by giving eyes right and placing their straw hats over their hearts.'"